February 16th, 2014 - Steve Wiltshire—who grabbed every eye in the standing-room-only crowd as the "last man standing" at the Kong Off 3—found himself in an awkward position a few weeks ago: he'd just achieved 7th place all time in the Donkey Kong standings, but there was no official referee to whom he could submit the score. Four months into its mysterious disappearance (which I wrote about in January), Twin Galaxies ownership has yet to utter a peep about its whereabouts. Every day that passes brings more gamers into the growing camp who have come to believe that the organization is gone for good. 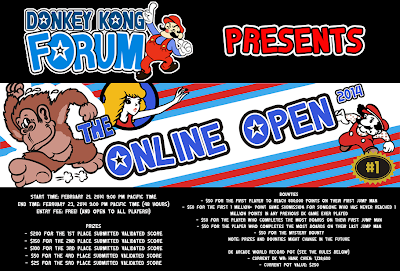 With Wiltshire submitting a YouTube video of his game to the Donkey Kong Forum for peer review (where it was quickly verified and added to the forum's unofficial Donkey Kong scoreboard), the community seems to have reached a more-or-less explicit consensus that as far as DKF verifications are concerned, it's probably about time to shave the first two letters off of "unofficial." 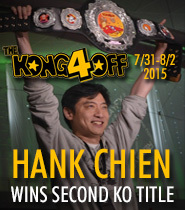 Wiltshire's newest score adds fuel to the sentiment that Hank Chien's reign as the King of Kong is extremely likely to come to an end sometime in 2014. Given the five players parked right behind Chien boasting scores within 50,000 points of his title, and Robbie Lakeman even now in the midst of an active and public push for it, the smart money is betting on the field. It's only a matter of time until the record goes down. When it does, the community cannot defer, to an entity that it's not even sure still exists, the authority to proclaim a new world champion. 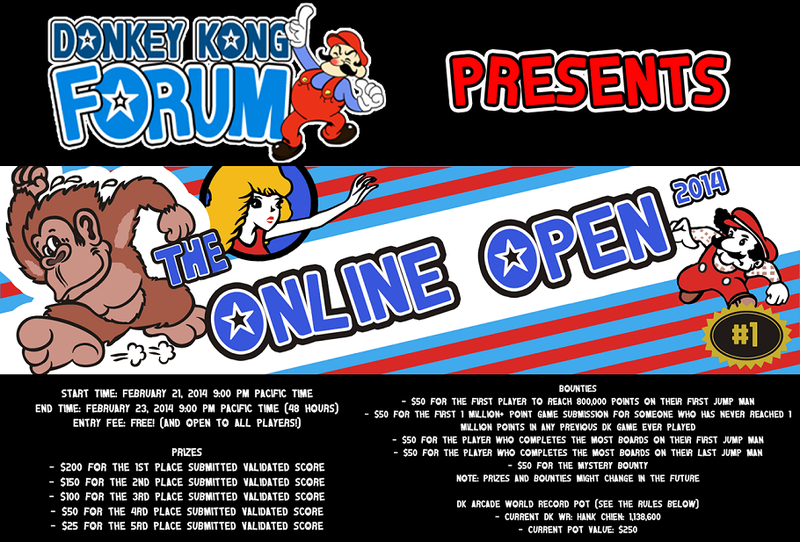 With nobody else to make the call, Donkey Kong Forum will have to do the honors. And so, not by coup d'etat, but rather by default, it would seem that DKF has taken the reins as our game's official scorekeeper. 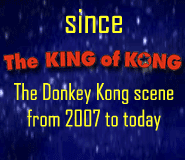 If you've visited Donkey Blog's Top 20 Scores page within the last few weeks, you will have noticed that the list here has been rebuilt to match the one at DKF. The Top 20 now aggregates scores verified by TG, MARP, and the referees at DKF (in addition to mixing arcade scores with those achieved on the MAME emulator). The stark truth is that TG's scorekeeping model has not been viable for some time as a true reflection of all-encompassing "world" rankings, because their data set has the considerable weakness of only incorporating scores verified in-house. This may have worked in the 1980s when there simply weren't any other scoreboards to submit to, but it doesn't work in the 21st century, when there are many. To make a legitimate claim of comprehensiveness, a modern scoreboard needs to assimilate the scores from all of the self-contained competitive communities (such as MARP and RetroUprising), along with those of any other reputable sources (such as TG, RecordSetter, Aurcade, etcetera). This is the model on which the Donkey Kong Forum scoreboard operates: as a multi-source score aggregator and adjudicator. So while the return of Twin Galaxies would be welcomed with relief and enthusiasm, it has become clear that neither this blog's scoreboard nor the forum's can ever revert to being TG-centric. There are too many top scores now (including the MAME world record) that aren't and never will be submitted to Twin Galaxies. In the Internet age, drawing from all available scoreboards has become the only way to reflect the true rankings. This weekend (February 21st through 23rd), Twitch.tv will host the first in the next series of semi-regular online Donkey Kong tournaments, refereed and sponsored (as always) by Eric Tessler and John Salter. 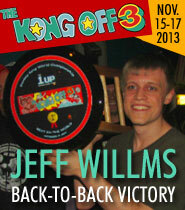 This time, the goal is not to decide the wildcard lineup for a future Kong Off (which was the focus of the last three Opens), but to put a price on the head of the current world record. 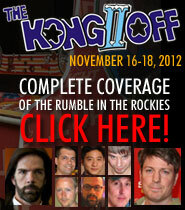 The pot starts at $250, and will rise by an additional $100 for each tournament in which it remains unclaimed. Needless to say, any player who collects this pot will be considered the world champion by the DK community... even if they have to go without TG's stamp of approval. An affectionate and grateful farewell to Twin Galaxies for its 32 years of service. Thanks to Donkey Kong Forum for taking it from here. Congratulations to Steve Wiltshire for his new 7th place all-time score. And good luck to this weekend's competitors! If you would like to play in the tournament (admission is free, with hundreds of dollars in cash prizes up for grabs), please visit this link for details. Twin Galaxies isn't dead. It's coming back very soon. So, not so fast on all this. I agree with the suggestion that going forward TG need to be about not just the scores it verifies but also scores from other repository sites and scoreboards. The list would be as complete as possible, but the differentiation of what the source of the score was (TG, Aurcade, etc) is useful for players who want to make their own decision on which score is "best". In the past, this failed miserably for TG, I should point out. Walter accepted scores from an Italian scoreboard affiliated with TG and the scores were absolutely impossible, including four scores of 9.999 million on "Circus Charlie" which is impossible due to the score freezing at just before 1M. Walter/TG also accepted scores from Nintendo itself from their NES database, but those scores were not truly verified and many were the direct result of gamers benefitting from either the "Game Genie" or "Pro Action Replay" device, such as "F-Zero" (NES) times that were physically impossible. The problem was that it is impossible without seeing the performance to know if a great player did it without cheating, or if a mediocre player did it with a game enhancement device. Thus 20,000+ scores were thrown out of the TG database in the 2001-2002 range as a result. I like the idea of blending scores from TG, MAME, MARP, etc, but the caveat there is that some emulation scores cannot possibly be comparable to the real arcade scores for a number of reasons. Such as "Sea Wolf" which is infinitely easier playing with a mouse instead of a periscope. Or the Exidy shooter games where MAME/emulation provides a cursor to aim with whereas the arcade original does not. So it is great for most titles, not so great for others. Still, I like the idea of a central repository. TG need not "verify" every score. Online gamer verifications are a great idea as well, plus an individual chat per submission if possible, a historical commentary/audit trail. The one thing I would avoid is multiple scores on the same title per person. On another forum it was debated whether you could truly have a "Top 10 scores of all time" is you discounted from the same person 1 or more scores that technically were in the top 10. My position is that tracking EVERY score players set would make the database needlessly voluminous for no other purpose than to see, as stated, the highest scores ever achieved regardless of by who. One top player, apart from all the rest, could pretty much lock up the top 10 scores forever, if they wish. I just don't see the benefit in tracking or even analyzing that. Sponsorship goes a long way to keep infrastructure costs up to date. I always felt that TG verifying scores on new titles could, in conjunction with a new release promotion, garner some form of subsidy for the organization. Good publicity for the game maker, for TG, and potentially increased sales. Competitions are a great way to keep the spirit of gaming going, but having them on the same title year after year is not the best way to go...it kind of loses "oomph" after awhile. One of the ideas discussed years back was to choose a core set of maybe 10 titles or so which remain the same year after year, not unlike the Olympic decathlon. Gamers could then prepare for as long as they want in advance...there would be no surprises. This would result in the gaming equivalent of world record set, Olympic records set, stadium (arcade) records set, etc. Just a thought. I wish the new owner(s) well with their investment. I honestly do. Mixing MAME/Arcade scores is something that the DK community decided to do, by consensus, and I can't argue too much with that, except that on my scoreboard here I keep the world records separated (ie, an arcade machine world record and a MAME world record), because many people are dead against recognizing a MAME score as *THE* world record and I find a lot to sympathize with in that position. So the MAME score is the "true" world record; while the arcade machine score is the "traditional" world record. I also agree with you about yearly events, and wish that the Kong Off could have been given a rest for at least a year because of the burnout factor, but it looks like plans are already afoot for the 4th. If it's what Richie wants though, more power to him. "An affectionate and grateful farewell to Twin Galaxies for its 32 years of service. Thanks to Donkey Kong Forum for taking it from here. " Based on the recent full announcement by Jace and your Blog post supporting the new TG, I would hope the above sentiment is being left behind and you work well with the Jace's projects. cheers.